Let’s begin by understanding that many reunions are established to honor a special anniversary or birthday. Fiftieth wedding anniversaries, 80th or 90th birthdays are the oft-heard reason to create a reunion. Everyone has such a great time that they continue to meet. Then, interestingly, they continue to use those special dates by default. One family still meets on their long deceased parents’ anniversary in October which limits attendance to adults but suits them perfectly. If reunion is a new idea, members must save (vacation) time and money for the trip. Most family reunions occur between June and August for the convenience of families with school-age children. 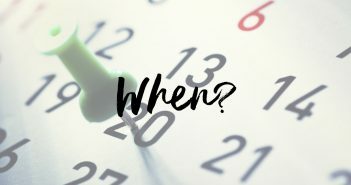 Other dates to consider are off-season school holidays or three-day weekends that take advantage of special promotions. Seasons matter — do you have school-age children? skiers? campers? sun-seekers? Plan accordingly. There’s nothing sacred about summer reunions. Kids are out of school in summer but they have three- and four-day weekends in winter — perfect times to get away, reduce cabin fever and enjoy the company of family. There’re lots of benefits to winter reunions. Off-season prices work for winter reunion escapes. Some resorts feature up to 50% rate reduction in winter, as well as free special programs for children. 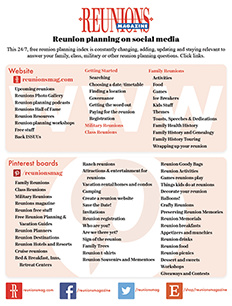 Many reunions designate the same day year after year. The third weekend in July has been etched in stone for the Seideman family for over sixty-six years. Seidemans are scattered around the world and they never discuss the day of their reunion because it is fixed. Another family uses this formula: the Sunday closest to July 15th every other year in even years. Having a consistent, fixed reunion date has other bonuses for families for whom it is not easy to get everyone together. After children are grown, you can never expect all your children home for all major holidays. Once they marry they have obligations to new in-laws. But you can expect them for a reunion if you’ve designated your own special reunion date. Make it your special family holiday! The prolific Andrew Elton Williams, starting around 1822, begot ten children by his first wife and 13 by his second. These twenty-three children begot 145 grandchildren and by 1990 more than 70,000 Andrew’s descendants had been traced. Their first Williams reunion was held in 1903 at Reddick’s Mill, Florida. Everyone wanted to meet in autumn after crops were in. They discovered in the Farmers Almanac, that there had been no rain on the first Thursday in October for fifty years so they selected and stuck with that day until 1963, when it rained. Since then the reunion has been held every year on the first Saturday in October. For some family members Saturdays are more convenient than Sundays, or vice versa. The Gottfried Wilke Family Reunion is a lavish potluck picnic on a Saturday one year and Sunday the next. The Gottfried Schmitz clan always meets the second Sunday of July in even-numbered years. Holiday weekends are popular because most families have one or more automatic extra days. By far the most popular reunion holiday is July 4th, when millions of Americans celebrate the nation and their families. The Tommy and Joe Shields Family Reunion is July 4th every five years in the Clarkfork/Hope, Idaho, area. 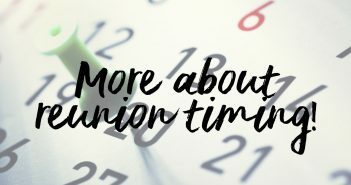 Reuniting every five years on the same date gives family members time to anticipate, plan and save for this special event according to Joy M. Yockey, Montesano, Washington. The Nichols Family Reunion and Heritage Day celebrate the nation’s birthday and the anniversary of the arrival of Robert Nichols to Maryland in 1635. Lloyd Johnson’s Dixon Family Reunion meets for a full week around Independence Day every other year. The Zeigler Family Reunion meets every July 4th weekend in Rockford, Alabama, where they decorate boats for a patriotic boat parade according to Nancy Zeigler, Paradise Valley, Arizona. Teresa Lilly says Santa understands the Lilly Family Reunion celebrates Christmas at Thanksgiving when the sisters are able to come home with their families. Santa leaves “turkey bags” to celebrate Christmas at Thanksgiving. They decorate a Pilgrim tree with Indians, turkeys and colorful ornaments. They use brown butcher paper to wrap presents that kids decorate with crayons, leaves and Thanksgiving stickers. “Turkey bags” are brown paper grocery bags stapled closed and decorated to look like turkeys (colorful construction paper heads and tails). Santa hides the bags while everyone enjoys Thanksgiving dinner. Or how about Christmas reunions? Michele Hendricks, Loveland, Colorado, reported that the Newton Family held their first reunion at Christmas and discovered the joy of simplicity and doing for each other. Activities included a hike in the woods to cut the perfect Christmas tree, making gingerbread cookies, stringing cranberries and popcorn, creating personal Christmas cards and a visit from Santa Claus. Pam Johnson Taverner’s Johnson family scattered to Tennessee, Illinois, Connecticut and Kansas but reunite every other Christmas at their mother’s new home in California. Or celebrate Christmas like Ellen Clark’s Ray/Clark Family Reunion in Beech Mountain, North Carolina, in July when they celebrate the holiday they know they can’t spend together. When Vivian Anderson, Lincoln City, Oregon, turned eighty the family planned a reunion in July with a Christmas theme at Fogarty State Park near Newport, Oregon. They drew names for gifts and a stocking stuffer. Anderson knit thirty red stockings. A son-in-law caught salmon and barbecued it. No matter what date you choose for your reunion do so carefully and when it’s done, stick to it. If you change your date for one person, someone else is surely going to need a change as well. So by sticking to your date, you start planning other details such as “where” and “what” with greater confidence. Edith Wagner is the editor of Reunions magazine, author of Reunions Workbook and Catalog and The Family Reunion Sourcebook (1999, Lowell House, Los Angeles) in bookstores. Next Article More about reunion timing!